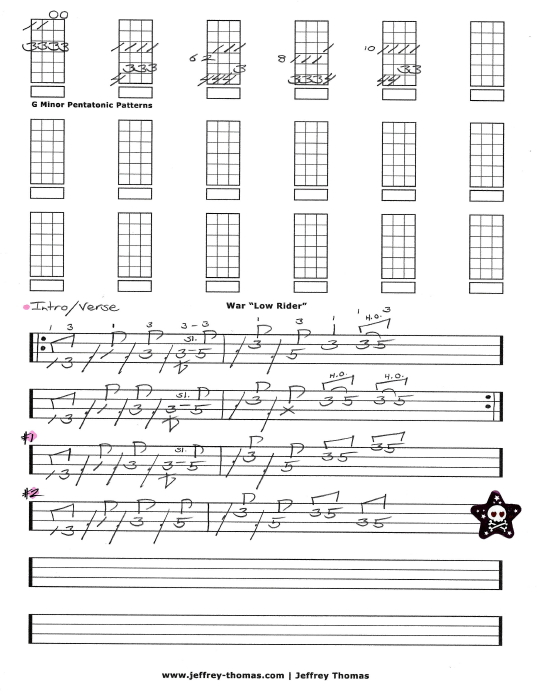 War Low Rider Free Bass Tab by Jeffrey Thomas. Learn to play this classic, retro funk tune by War. My free bass tab shows the main intro verse line and two alternate lines. I have also included all 5 pentatonic patterns for G minor. These patterns will help you to jam on the song better. Enjoy the free video preview and submit your email for the full tab. Looking for online bass lessons? Fill out the Schedule A Free Lesson form to set up a free Skype bass lesson today! “Low Rider” by the American funk band War was released in 1975 are was a number one hit for the band. It also is a defining song for the Chicano car culture. Find more free online bass tabs on my blog, video and tab pages!